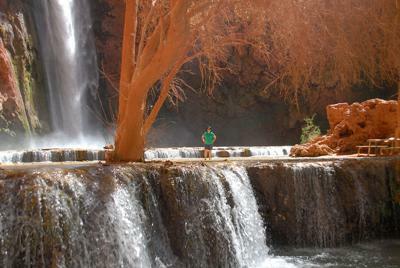 We hiked to Havasu Canyon last week. The entire trip was full of stunning scenery, but Mooney Falls was our favorite. One has to work a bit harder for Mooney Falls. It is 3-4 miles from the village. The climb to the base of the falls is challenging, but doable for a couple in our late 50’s. As an amateur photographer, I could have spent the entire day taking pictures from different angles in different light.